Right as smartphones are getting bigger and faster, we're somehow bored and want something new, not iterations of the last thing and the thing before that. Suddenly, wearable tech is the newest trend—people aren't happy to be regular humans; they want electronic attachments that take us out of reality and turns life into a game—or at least makes everything more bearable. The past few months in particular we've been hearing rumors of smart watches coming from multiple companies: devices that don't just tell time, but let you read email (oooooooh) and check texts (aaaaaaah). And other watch stuff. And maybe tell time, sort of. These tiny little Star Trek retirement gifts will become a wedge between your eyes and your smartphone, adding a middle man to make communication even more annoying and disconnected. But having a smart device on your wrist is, like, James Bond-level cool, right? Until the novelty wears off, and then it's just one big passive experience of information being filtered between your smartphone and your brain. The Pebble is a neat idea, but how much value is being added, really? So I say, why not just stick with the form factor we have now? You're going to look goofy flicking and poking and shouting into a piece of glass on your wrist anyway—the experience will never match up to a tablet or smartphone. 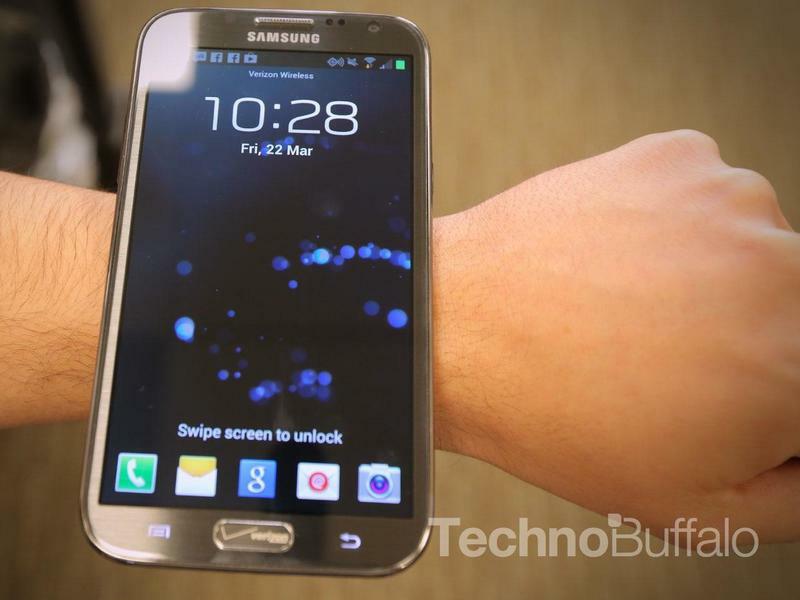 So why not make, say, a Samsung Galaxy Note II: Smart Watch Edition? It's certainly not out of the realm of possibility. Think of how much you'll be able to get done then. You'll know precisely when you get an email—and if you want to respond—and you can act right then and there. Bam, done. Instead of sticking your hand down your pocket and actually using your phone, you have a phone-size watch attached to your body—it can do everything your phone can do, and you never have to put it away. 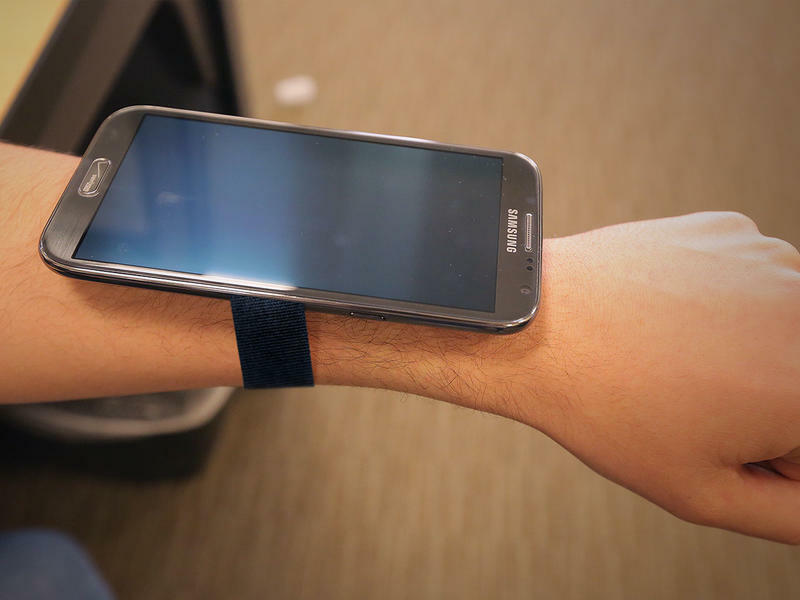 Which company is going to be brave and just attach a watchband to a smartphone and call it a day? Apple? An LG refrigerator watch? Google? If we're so bored with smartphones that we need to wear something on our wrist (or our face) to feel human and excited about technology, then let's go all out. The above concept isn't final (it's not a real thing, so don't think it is), but that might be what Samsung's smart watch will look like. If companies want to create an experience beyond Pebble, surely it'll have to be a large-ish device, right? And since the market is so eager to expand smartphone screen sizes, let's just marry the two—we're all thinking it.